As executive director of the district’s innovative learning department, Imbriale is overseeing a five-year project, called BCPS One, to move its entire curriculum online and make it available to teachers and students. He estimates that the district will spend more than $1 million a year on digital resources for its 108,376 students. The district was "lucky enough," he said, to get one of the governor’s innovation grants. On the other side of the country, the San Francisco Unified School District pays about $800,000 a year for software licenses and maintenance. Even with discounts from the companies, “the price tag is beyond the budget we get from the state” for technology, said Chief Technology Officer Matthew Kinzie. He said the district is seeking grants and donations to cover the costs. But depending on these occasional infusions of money and continuing to look for outside resources isn't practical. “Those are not sustainable funding streams that people can count on year after year,” said Doug Levin, executive director of the State Educational Technology Directors Association (SETDA). Funding – or lack of it – is the number one issue facing school districts as they convert to the digital learning world, said John Halpin, vice president of the Center for Digital Education, a national research institute that focuses on in K-12 and higher education technology trends. It’s not that districts don’t necessarily have money for instructional materials; rather, state policy and district proclivity often haven’t caught up with tech realities. States have operated for decades in a system where they have huge textbook adoption cycles where they shell out millions for, say, middle school science texts that are expected to last for five-to-seven years -- even if a new planet is discovered or dumped. In the transition to digital, districts buy a license for a specific software and pay based on the number of students using it. Though it's uncertain whether the move saves money, there are other benefits. Districts could negotiate for updates and improvements, just like any other software program. “In the software world you’re never done because every year people expect to take what you’ve learned about what works and doesn’t work and enhance it,” said Larry Singer, managing director for K-12 education at Pearson, one of the big three textbook publishing companies (along with McGraw-Hill and Houghton Mifflin Harcourt). “You have this period of time when many districts are going to be caught in between, using some textbooks and some digital content and devices, but we’re paying for both." 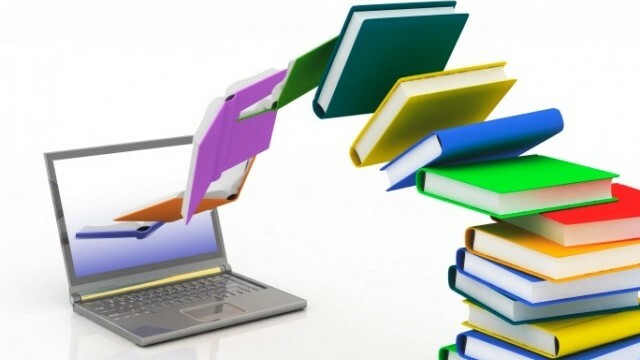 However, districts eager to go digital are often stymied by laws restricting textbook funds to print books. In other instances there’s no line item in district budgets for instructional software. The technological innovations that have permeated our private lives seem “so far to have eluded many of the 50 million students enrolled in public K-12 education,” according to a 2012 report by the State Education Technology Directors Association. Despite every best intention, the transition to digital isn’t quite here yet. The textbook market is slipping, but remains a multi-billion dollar industry for elementary and secondary schools. It added up to more than $2.5 billion for the 2009-2010 academic year, the most current figures available from U.S. Department of Education. While that’s a lifetime ago in the digital sphere, Halpin said it’s still fairly accurate; he doesn’t anticipate a significant drop in print textbook sales for a few years. “The decade we’re in right now is the decade of transformation. We’re transitioning from one to the other. It’s very messy; I often call it the messy decade,” joked Halpin. “You have this period of time when many districts are going to be caught in between, using some textbooks and some digital content and devices, but we’re paying for both." But that should change as state regulations become more flexible. More than 20 states have updated the definition of textbooks to include digital content and a handful, including Texas, California and Indiana, explicitly allow districts to use textbook dollars to buy digital instructional materials. North Carolina has moved to the forefront with a state law requiring districts to buy only electronic textbooks and materials by 2017. Even if districts had all the money they needed to purchase software, many would be unable to use it because they’re not connected to high-speed internet, have aging or too few computers or don’t have the capacity to bring the internet into every classroom. Only 37 percent of schools today have the bandwidth they need for digital learning, according to the Education SuperHighway, a nonprofit that provided free bandwidth testing to schools in the run-up to the computer-based pilot tests designed for the new Common Core State Standards. One rural school district in California bused 100 elementary school students to the high school to take the test, while another had to administer the exam one student at a time in order not to crash the computer network. Not surprisingly, the Education SuperHighway found that “the biggest correlation between those who have enough bandwidth and those who don’t is actually tied to the wealth of the school,” said Evan Marwell, the CEO and founder. The wealthiest 2 percent of schools in the United States are three times more likely to have the bandwidth they need than are the poorest schools, those with three-quarters or more of their students eligible for the free and reduced lunch program. The federal government is stepping in to help close the technology gap. On July 11, the Federal Communications Commission voted 3-2 to revamp the E-Rate program, which provides educational technology subsidies, and spend $2 billion dollars over the next two years to expand access to high-speed Internet and wifi to schools. A year ago, President Obama announced the launch of ConnectED, an initiative to solicit support from private industry to help close the digital divide in schools. Ten companies have so far signed on: Adobe, Apple, AT&T, Autodesk, Esri, Microsoft, O’Reilly Media, Prezi, Sprint, and Verizon. AT&T and Sprint have each pledged mobile broadband for 50,000 students who don’t have Internet access at home. Adobe, Autodesk and Esri have agreed to provide free software. “Rarely do schools have all that they need,” said Charlie Fitzpatrick, K-12 education manager for Esri, which developed geographic mapping software. He estimates the giveaway is valued at about $1 billion, but the company’s bread and butter comes from sales to government agencies and private companies, which use Esri’s software to analyze data on everything from finding patterns in earthquake depth, magnitude and location to improving public transportation routes. Fitzpatrick said the donation would help those paying customers by training the next generation of workers. ConnectEd has attracted high profile companies and raised awareness of the challenges that some districts face, but neither education nor industry officials see it as a long-term solution. San Francisco Unified has looked into some ConnectED companies, but Kinzie is concerned that with the free services limited to low-income schools or students, it would create fragmentation of software and hardware at a time that the district is seeking more standardization. “Discounts or free software from tech companies is not going to solve the bigger challenge we have, which is that we need a systemic investment in bringing our public school up to 21st century standards,” said Kinzie. SETDA’s Levin concurred, calling it “laudable” but not sufficient. SETD has called on the federal government to put some ongoing money into educational technology to close the digital divide, like the $3.73 billion invested in Enhancing Education Through Technology program between 2002 and 2010. Congress cut funding for the program in 2011; a year after the Obama Administration recommended the same thing. Pearson views ConnectEd as a sincere effort by the president to create technological equity between poor and wealthy districts. Some companies that aren’t a part of ConnectEd use similar marketing techniques by providing short-term, free software licenses to districts. To Singer, these programs won’t do much more than create an opportunity for low-income districts to experiment with various programs before plunking down any money to buy software. Districts “see initiatives like this as interesting things to try to take advantage of, but they see them as one-time opportunities,” said Singer. Sliding Scale Model for Low-Income Schools? Pearson doesn’t offer free or sliding scale software licensing fees and Singer said that in his experience price is rarely the issue. He said school districts are more interested in finding software that’s the best fit for their needs and technological capabilities, not the cheapest. The same is true of Houghton Mifflin Harcourt. Varying prices would violate “the most favored nation requirements established by our customers, which dictate equitable treatment across districts regardless of size or income levels,” explained spokesperson Leah Riviere. Discovery Education, which reaches more than a million students in 50 states with its streaming video service and online “techbooks,” also has no-haggle fees, but set them as low as possible to maintain profitability without pricing districts out of its market. A year of streaming video is $2,000 to $3,000 per school, while techbooks are $45 per student through grade 8 and $55 per student in high school for six years – that includes updates so information stays current. They can do this because the company was never a traditional publisher so it never had a traditional mindset, said Senior Vice President Scott Kinney. “Because we didn’t have that legacy, we could literally cut our costs in half and pass those right along to our [customers],” said Kinney. Mind Research Institute, creator of the popular ST Math, offers volume pricing as does Achieve3000, developer of a popular program for differentiated instruction that tailors the same lesson to meet the academic ability of each student in a class. Achieve also accommodates poorer districts with sliding scale fees. Even companies without discounts often provide free trials or work with school districts to meet their curriculum needs and budgets, while still keeping an eye on the corporate bottom line. “We can't give it away, it took a lot to build, but we can say we want to find a way to work with you and the means and resources you have available,” said Justin Hamilton, head of corporate communications for Amplify, developer of digital curricula in math, science and English. Samsung hopes to boost interest in its Chromebooks, tablets and interactive classroom platform with a contest worth $2 million in technology for public schools that submit the most innovative digital curricula in science, technology, engineering and mathematics, or STEM subjects. No Longer a One-Way Street? Still, the switch to digital will force Pearson and other publishers of educational resources to reimagine their marketing strategies. In the past, a district would purchase a complete set of textbooks from a single publisher and everything students needed to learn in a particular subject would come out of those books. It was also a one-way street. "When I was sitting on the other side of the desk as an educator, people would always want to tell me what they were selling," said Discovery Education’s Kinney. In the digital era, sales are more personal and directed. Companies have to act as consultants and problem solvers. "The new model is what are your goals and objectives and how can we help support you?" added Kinney. Digital materials make it possible for à la carte approaches, said Julia Freeland, co-author of Schools and Software: What’s Now and What’s Next, for the Clayton Christensen Institute for Disruptive Innovation. That includes the open-source movement among teachers and some organizations who share curriculum, content, ideas, lesson plans and software for free. CK-12, a nonprofit company that has been around since 2007, not only doesn’t charge for its online publications, it also works with school districts to adapt the content for their specific curriculum needs. Founder Neeru Khosla said districts began paying more attention to them during the economic downturn when "free" wasn’t a commonly heard word. Los Angeles Unified, Seattle and Madison Metropolitan are among the growing list of CK-12 users. Pearson expects its share of both the print and online K-12 instructional market to dip in coming years, and has been building a new niche market for itself as a digital and services business. Over the past decade, the company has been buying testing and assessment companies that will position it, among other things, to give the online exams required by Common Core State Standards. As part of that transition, Pearson announced earlier this month that it will have eliminated 4,000 positions in its global workforce by the end of this year, but is offsetting that with the creation of 1,800 new digital jobs.